A young boy I know asked if I would contribute some cookies to his Bicycle Safety Fair. The Fair is the crowning event toward earning his Eagle Scout award. 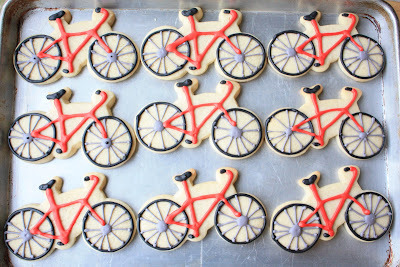 He told me that I could make any kind of cookies that I wanted, but of course bicycle cookies were the logical choice. I hope he liked them! I didn't get to talk to him when I dropped them off due to all the hubbub. The cookies were made using my favorite sugar cookie recipe with royal icing, both recipes found on this post. I used my new AmeriColor Super Red and Super Black Soft Gel Paste Food Coloring, and as you can see they worked great! I love them! Love the bicycles! Thanks for stopping by my blog, love yours!! Oh Sue, you amaze me. I want to come and sit in your kitchen for a week! He must have been thrilled. What a fun idea and so cute. 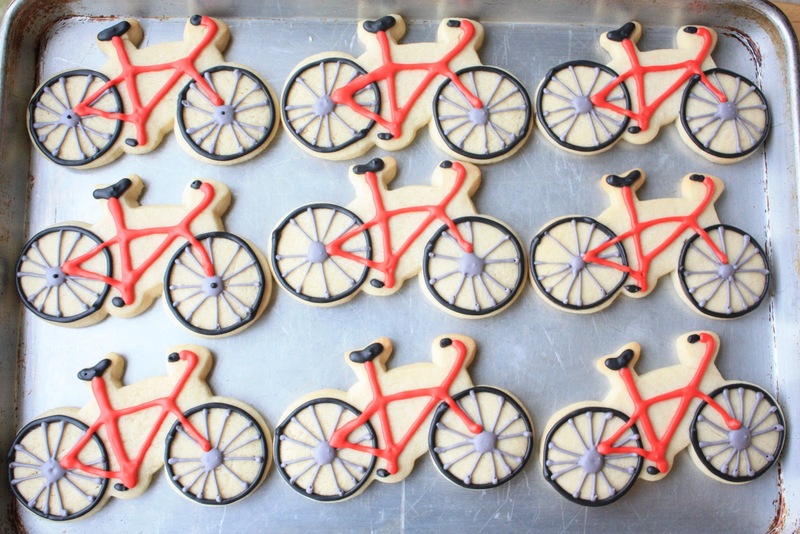 Did you just make up the bicycle shape or did you have a cookie cutter already for it. Love the red and black too. Those are incredible! Absolutely love them. Of course he will love them! They are so gorgeous and fun. Oh WOW Sue those look so cute! !..absolutely love em!! Sue, I love those bicycles! :-)) So fun! You are a genius. OMG. Sue! These are incredible. they are so adorable! Of course he loved them, who wouldn't??? These are amazing Sue!!! All the details are just spot on, these are some great bicycle cookies!! Could you move to my house and bake cookies for me?? I'm sure those were the top sellers of the bake sale! Sue, Your cookies look so professional! It really touches my heart that you would do that for that guy :) I have 4 brothers who are Eagle scouts and I know lots of people helped them along the way. Thanks for sharing your cookies. These look so wonderful Sue! I am completely impressed! Very creative! You are amazing, Sue! I see lots of dedication in decorating these bicycle biscuits...very adorable. Wow, I can just see all the hard work you must have put into making these. I'm sure that he truly appreciated them and was thrilled to see such amazing cookies. Thanks for linking these up. You did a fabulous job :) And I love the coordinating ribbon. How difficult is it to control the icing when doing such a detailed design. I've always wanted to try my hand at this type of thing. They turned out great, I bet the boy scout was very happy with them! 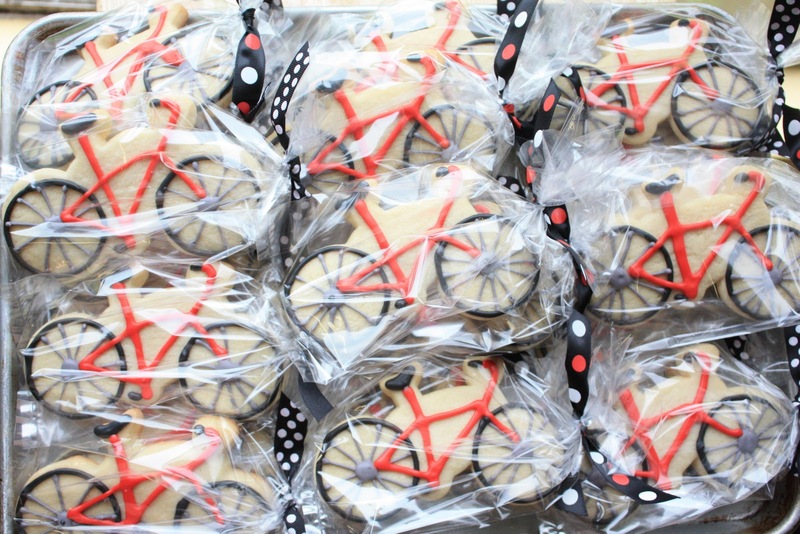 I cannot imagine a more perfect cookie for a bike safety fair. I am sure they were a big hit. 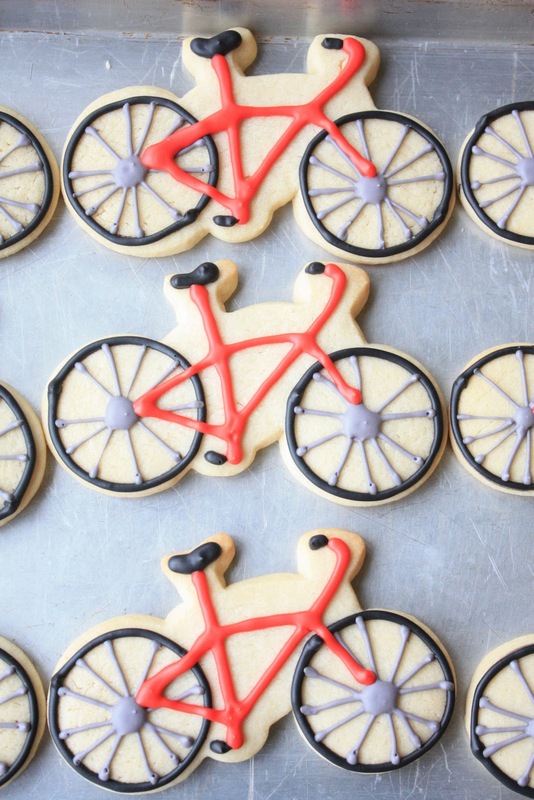 This is the first time I've ever seen a bicycle, both a cutter and the decorated cookie. You did a fantastic job. The young boy must have been so excited when he saw the cookies! Love all your attention to detail in these and the colour. Who didn't want a shiny new red bike when they were a kid!? They look so wonderful!!! What a great idea! Wow what super cookies and they look even better all wrapped up and ready to go. I'm betting he did like them, in fact I bet he (and/or his parents) were speechless with how adorable they were. I bet he more than liked them I'm sure he loved them. Your cookies are amazing! Oh my gosh - your cookies are amazing! You did such a beautiful job decorating them. I'm sure they were a hit at the fair. I'm going to check out your sugar cookie recipe - I never am too happy with how mine turn out. they look absolutely spot on! bet they were a huge hit! These are great! My husband and 28 year old son just finished a bike repair course together. Hubby is out right now working for a local charity that is repairing unwanted bikes and rescuing bikes from the landfill to provide bikes to low income families, schools and even a dozen to the zoo to help the employees get around! I can't wait to show them your cookies! WOW Sue! These are amazing! Everything is SO neat. I mean...if I tried to pipe circles for the tires of ONE bike...it wouldn't be a circle. Much less that many of them. I love that there is just enough details on these cookies! I feel like a broken record, but your treats are always so cute cute cute! The piping is so perfect! Those bicycles are too cute! So, did you have a cookie cutter, or did you make your own again? You are very clever.